(SPOT.ph) Los Angeles Lakers basketball star Kobe Bryant surprised players and fans alike when he insisted on playing with selected UAAP cagers during his Manila visit on July 13, reports ABS-CBN News. Bryant was in the Philippines for Nike's five-city Asia tour. He was supposed to watch a 10-minute exhibition game between selected UAAP players and the national team, Smart Gilas, at the Araneta Coliseum. After Smart Gilas creamed the UAAP All-Stars 33-24, Bryant stood up and announced, "Put eight more minutes on the clock and I'm playing with the UAAP Stars." Donning an FEU jersey, Bryant led the young UAAP team for a second, unexpected quarter of the match. With the NBA champ's help, the All-Stars managed to muster a 41-point game against Smart Gilas' 43. Regardless of the score though, players from both teams were visibly in awe that they were playing with one of the world’s best basketball players. 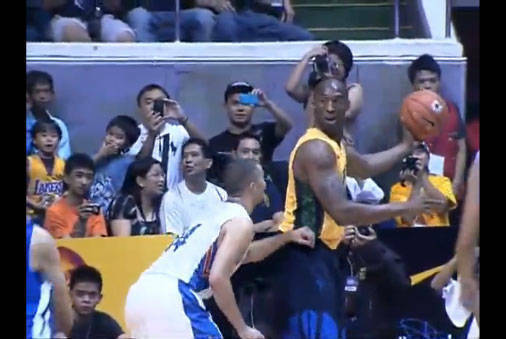 According to an ABS-CBN report, this was the first time Bryant decided to play in an exhibition game during a Nike tour. Meanwhile, model-host Bianca Gonzalez, who hosted the exhibition game with Boom Gonzales, was ecstatic that Bryant gave her a hug and a kiss. Over Twitter, she exclaimed: "I’m still in shock!!!! Kobe gave me a big hug and made me beso!!!! I’m like a giddy high school girl!!!! i love nike!!!!." She added that she her admiration for the NBA cager grew more when he played with the local players. Click the photo to watch ABS-CBN’s video coverage of the game.